Book two has been sent off to my editor! Woohoo! In less crazy news, book two has a title: Aurora Blazing. It’s due out late next year, currently October (subject to change, etc, etc). Somehow, Goodreads already knows more about it than I do. I don’t know what kind of data ninjas they have over there, but nice work. Polaris Rising is the story of Loch and Ada. Aurora Blazing picks up where PR left off, but it’s the story of Bianca and Ian. Bianca is Ada’s sister. My com vibrated and Ian’s info reappeared on my glasses. The five-minute block had expired. I confirmed Aurora was on course for orbit, then accepted the video link as voice-only on my side—I could see him, but he couldn’t see me. If I’d thought I’d seen Ian at his angriest before my meeting with Evelyn, I’d been dead wrong. I’d never seen him so furious as he was right now. His face was set in lines of granite and his eyes blazed with temper. His jaw was clenched so hard I was afraid he’d break his teeth. It seemingly took him a force of will to open his mouth. “Lady Bianca, return to the ground. Now,” he gritted out. Adrenaline and fear and anxiety mixed into a potent tempest that pounded through my system. “My brothers and sisters are everything to me,” I argued, deeply insulted. I pressed my lips together to prevent an angry tirade from spilling out. There were so many things I could add: how Ferdinand used to take my punishments when I was sick or injured, all the way back to the faint edge of my earliest memories; how Hannah had shown up after Gregory’s death and bundled me home without a single question, despite the righteous fury in her eyes at my weak condition; how my siblings were the only people in the ’verse I knew loved me for me. I would personally storm the gates of hell for any of my brothers or sisters. To claim otherwise was to fundamentally misunderstand me as a person. Realization dawned. Ian was far too clever to make such a mistake; he was trying to use my love for Ferdinand against me. It would be so easy to underestimate Ian Bishop, to be blinded by his gorgeous features and miss the intelligent, patient predator lurking beneath the surface. I vowed not to make that mistake. “You have an interesting way of showing you care,” Ian said. Even knowing what he was up to, it was good that he was currently on the ground or I might be tempted to throttle him. Actually, I knew Albrecht von Hasenberg better than nearly anyone. He’d want to keep me close to save face, sure, but also because he knew I was the best intelligence officer in the House. He didn’t know about my network, but he knew that I could find information no one else could, an invaluable skill to a House with secrets to hide and arms to twist. Rough draft excerpt from Aurora Blazing by Jessie Mihalik. All rights reserved. Coming late 2019 from Harper Voyager. If the snippet is a fair example,,,, this will be a best seller. Super excited for this series! Every snippet I have read has pulled me in and I cannot wait till they are released! Oh no ! As much as I love reading these snippets , having to wait is going to break me . Keep up the good work Jessie . Am sure your books will be best sellers . Can relate to the stress, not always easy! A little question, there are a lot of brothers/sisters will you do a book for every single one of them? Or will change universe after PR2 or just do third? Loved the snippet! Can’t wait to read it and PR too! A little question, they seem to be a lot of brothers/sisters in the family, will you do a book for every single one of them? Will you change universe entirely? Or just a third book and then no more? In any case, your characters really seem interesting, can’t wait to discover them and this universe! Oh no…I wish I hadn’t clicked on the link to the Aurora Blazing page, because it seems really spoiler-y for Polaris Rising. Edit: In case it wasn’t clear from my post, Aurora Blazing features a new couple. Bianca and Ian appear only briefly in PR. I didn’t think thes nippet was spoilery at all. Yes, it’s the same universe and related characters and while I’m assuming (hoping!) you’ll give Loch and Ada a HEA together after various twists and turns, I’m not sure how that is spoilery? This sounds wonderful! 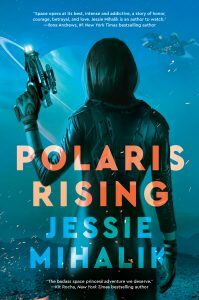 I’m even more excited to purchase Polaris Rising now. Getting to read the Queens Gambit along with your snippets reassures me that I will really enjoy your work. I have a rather small new books budget, but since my library isn’t purchasing your books and I want to read them, it’s an easy decision! Ooooh looks great! Congratulations! Excited for the releases. When do you think QG2 might be working its way our direction? I’m planning to start posting TQG2 in late November or early December! Oh that’s great news thank you! I’ve been imagining Samara meeting up with Valentine for his ‘training’ and am convinced it will be steamy and full of twists as they investigate the Kos traitors- can’t wait! Previous PostPrevious POLARIS RISING Early ARC Winners!